Fans of Chasing Vermeer and The Wright 3 will cheer that their heroes Petra, Calder and Tommy are back in action. The trio are now in 7th grade and a bit miserable as their new teacher, Ms. Button, is uptight, unoriginal and looks to make the school year terrible. But even Ms. Button can't completely ruin a trip to the museum where a sprawling display of Alexander Calder's giant mobiles are being shown. Calder was named after the artist, and is particularly interested in a room where people are encouraged to play "the Calder Game" and create their own mobiles. Calder is also thrilled to be going on a trip to England while his father attends a conference. To their surprise, an Alexander Calder sculpture has recently been donated to the town they are staying in and the townspeople are less than happy about it. 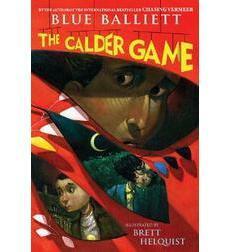 Then on the day Calder goes to visit nearby Blenheim Park, both the sculpture and the boy disappear. What happened to them? Is it connected? Petra, Tommy and Mrs. Sharpe race over to England to begin investigating and time is of the essence when missing persons are involved. Can Petra and Tommy overcome their dislike of each other to find Calder? As in the other books, our heroes use math, pentominoes, language, sharp eyes, treasure hunting skills and original thinking to help solve the mystery. Although this story is not as tight as it could be and readers may figure out some of the clues before our heroes, it is still an engaging read, filled with interesting tidbits and some suspense.